In the dystopian future imagined by author Ray Bradbury, fireman Guy Montag burns books while his wife Mildred obsessively watches television on wall-sized screens. It may have sounded far-fetched when Fahrenheit 451 was published in 1953, but picture the typical living room in 2013: A person might have the same wall-sized TV playing in the background, while more intently watching a movie on his iPad and intermittently responding to emails on his iPhone. The American University Library and AU’s School of Professional & Extended Studies (SPExS) have teamed up to sponsor Books That Shaped America, a series of conversations for the local community and AU students, faculty, and staff. 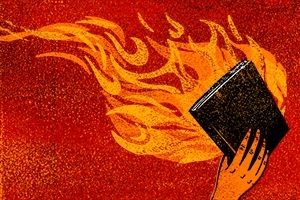 The series has explored why certain books had a lasting impact on American culture, and why classic literary works like Fahrenheit 451 remain pertinent to the modern world. It’s hard to miss the allure of the Books That Shaped America series. “We invite people to come in and have dessert and coffee, and sit around and talk about books. It’s been great fun,” says AU University Librarian Nancy Davenport. The program was inspired by the Library of Congress, which selected 88 influential American books in 2012. The list includes not only fiction, but political works and manuals, such as The Common Sense Book of Baby and Child Care by Benjamin Spock. The Library and SPExS sent the same list to AU faculty members, trying to gauge what books they’d be interested in presenting for discussion. “It was amazing the people who signed up right away and wanted to be involved because the books spoke to them for one reason or another,” Davenport recalls. The program’s goal has been to attract not only people from AU, but citizens in the wider Washington, D.C. community. “We have community members who really want to come to the university to be able to meet faculty and have this kind of an intellectual engagement,” says Davenport. Though he was writing about a secluded New York valley, that “spell over the minds of the good people” aptly describes America’s fascination with Irving’s own masterpiece. After American University Washington College of Law professor Lewis Grossman signed on to lead a discussion of “The Legend of Sleepy Hollow,” he did research with Google Ngram Viewer to measure the enduring legacy of Ichabod Crane and the Headless Horseman. This book series has tapped into the talents of AU’s large, diverse faculty. Being a law professor, Grossman certainly doesn’t deal with Washington Irving on a day-to-day basis. But in addition to his law degree, Grossman has a Ph.D. in American history and he’d previously written a paper on the story. Grossman described the book discussion experience as joyous, and he was recently asked to give a similar talk at the Library of Congress. To understand the breadth of this Books That Shaped America series, imagine a book talk featuring a physics professor doing scientific experiments inspired by an out-of-print text from the 18th century. AU Physics Department chair Nathan Harshman led a discussion of Benjamin Franklin’s Experiments and Observations on Electricity. “In the book, part of what he describes is a series of public experiments he did,” Harshman says. “So I also knew that this could be a very fun, exciting, and engaging activity for the audience.” For instance, Harshman came to the discussion with Leyden jars, which can store electrostatic energy. The next discussion, on November 19th, will be led by Davenport and feature Fahrenheit 451. Davenport attributes her interest in the novel—which deals with book censorship—to her work as a librarian. Like Fahrenheit 451, modern literature is rife with bleak nihilistic visions of the future, from George Orwell’s 1984 to Cormac McCarthy’s The Road. Dystopian fiction can be surprisingly popular, as The Hunger Games series has become an international sensation. The latest film installment, “The Hunger Games: Catching Fire,” is set to be released later this month. The survivalist world of The Hunger Games seems relatable to reality TV madness, with heroine Katniss Everdeen getting media training right before she’s heading into battle for potential slaughter. Likewise, despite the nightmare presented by Fahrenheit 451, Books That Shaped America shows that people still love to read books. As Davenport points out, towards the end of Bradbury’s novel a group of characters can recite entire books orally. They don’t burn them, but they’re burned into memory.